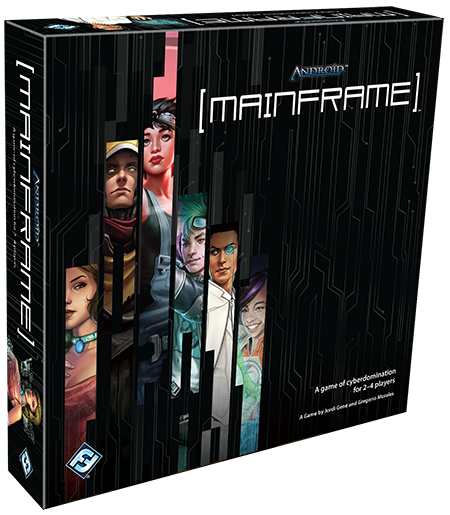 Fantasy Flight Games is proud to announce the upcoming release of Android: Mainframe, a fast-paced strategy game set in the not-too-distant future of the Android universe! In Android: Mainframe, you and up to three opponents become elite cybercriminals known as runners. When the mainframe and fortunes at Titan Transnational Bank are suddenly compromised, it's time for you to go to work. But it turns out that you're not the only runner who has been alerted to Titan's woes, and that means you're not the only runner in Titan's servers. It's time to show your competitors what you can do: execute your programs, establish access points and partitions, and seize control of the mainframe. Easy to learn and hard to master, Android: Mainframe typically plays in less than half an hour, and its six different identities provide six distinct approaches to the challenges of accessing and securing Titan's vulnerable accounts. With more than ninety partitions and a total of seventy-five programs, Android: Mainframe is a thriling, high-powered trip into the future of cybercrime! What's better than stealing riches from a helpless megacorp? Stealing riches from a helpless megacorp and demonstrating your superiority over other runners as you do it! In Android: Mainframe, you compete for control of different nodes within Titan's servers. Lock down a node, and you score its riches. At the end of the game, the richest runner wins. However, outrunning other runners can be a trick—even trickier than hacking through corporate defenses. While you're hacking your way into the server, your competitors may very well be hacking your hacks. You might lay down an access point or reroute a data stream only to find your efforts subverted. At the beginning of the game, you arrive at the Titan mainframe, and you mark your arrival by the placement of your first access point. Then, each turn, you get to take a single action: you can establish another access point, execute a program, or pass. Your goal is to use the programs at your disposal to secure your access points so that they control as many of Titan's vulnerable accounts as possible. By establishing an access point, you add one of your character's tokens to the game board, placing it faceup on an unsecured node. When you execute a program, you can execute any of the generic programs in the program suite, or you can execute one of the three signature programs with which you start the game. If you choose to pass, play proceeds immediately to the next player. If all players need or choose to pass, the game ends, and you and your opponents score your runs. Most of the generic programs write pathways between Titan's various nodes, allowing you to place a blue partition between the nodes on the board. Whenever your partitions seal off a section of the board containing only your access point or access points, they are "secured" and flipped facedown. They are no longer vulnerable to your opponents' programs, and you will score the accounts they control at the end of the game. It's Chaos Theory's turn, and she decides to use Zig to secure her access point within a node. She places the partitions, secures the node, and flips her access point facedown to indicate that the node and her access point are secure and can no longer be manipulated. Still, programs do more than simply allow the creation of pathways of different shapes. Some programs allow you to disrupt pathways by moving partitions. Other programs allow you to manipulate your or your opponents' access points. Finally, your signature programs are limited only by their text. Some may delete opponents' access points, establish multiple access points in a single play, or even grant you an extra turn. Runners are notorious for breaking the rules and creating chaos, so to get as much money as you can from your efforts, you need to keep your strategy flexible and fluid. You'll also want to strike quickly whenever you sense a chance to capitalize upon the unique abilities of your signature programs. It's possible that if some amateur hackers had the right tools they could possibly break into Titan Transnational Bank and access its accounts. It's doubtful that they'd manage to walk away with a score. You, however, are not an average hacker. In Android: Mainframe, you are an elite runner. More specifically, you are one of six of the most notable cybercriminals in the Android universe. Whether you choose which runner you'll become or assign the identities at random, the first thing you do in Android: Mainframe is step into a new identity and gain access to that character's unique suite of programs, all of which come fully loaded with personality. Modified in utero for superior intelligence, Ji "Noise" Reilly disappointed his parents by using his gifts for hacking, and his system intrusions range from damaging viruses which destroy corporate servers to defacing a corp’s Net presence in embarrassing but harmless ways. Kate "Mac" McCaffrey is a digital tinkerer who constantly writes, modifies, and reverse-engineers new programs, many of which she has distributed among the cybercriminal community that populate the Shadow Net. The dispossessed ristie known only as Andromeda lost her fortune and most of her privilege and access along with it. Knocked to the lowest rungs of civilization in New Angeles, Andromeda swore to recover her rightful place, and NAPD’s Netcrimes Divison has associated her with several high-profile security breaches in which large amounts of valuable data and banking information have gone missing. Olivia "Chaos Theory" Ortiz is a wünderkind whose ability to access nearly any server by finding multiple means of ingress inspires jealousy in adults with twice as many years of hacking experience. An infamous information broker who views every situation as an opportunity to gain information, Nero Severn has few friends, but a wealth of connections and sources, which provide him information that he consistently leverages to his advantage. Adam is an anomaly: a bioroid with a compulsion to hack and who is, by all appearances, operating on a unique set of core directives. The source of his compulsion is unknown, but his ability to invade and take control of a computer system is second to none. Each of these runners comes with five distinctive programs, and although you'll randomly narrow them down to three at the beginning of the game, they offer powerful and thematic approaches to the game's ever-evolving puzzles. Will you play them to take an early lead? Will you use them to block your opponents at key moments? Or will you hold them in your hand to keep your opponents guessing as long as possible? No matter how you use them, your signature programs are important tools, and they lead to dramatically different play experiences as you swap runner identities from game to game. Titan Transnational Bank stands exposed and vulnerable. Key corporate accounts lie undefended. Will you beat your opponents to the haul? Can you find fame and fortune on the year's biggest run? Prove your worth as a hacker in Android: Mainframe. 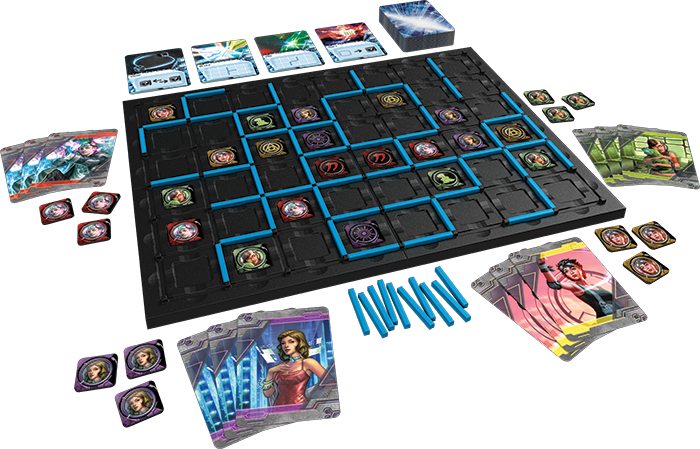 This game of cyberdomination in the Android universe is scheduled to arrive at retailers in the second quarter of 2016! A fast-paced game of cyberdomination for two to four players, Android: Mainframe allows you to assume the role of one of the elite cybercriminals known as runners. Alerted to the fact that Titan Transnational Bank's mainframe was suddenly made vulnerable to your intrusions, you hack your way in – only to find you're not the only runner there! Can you outmaneuver and outhack the other runners to score the greatest haul? Jack In. Run Fast. Get Rich.